Hello, well you can certainly tell that Wimbledon and Glastonbury are here because the wonderful sunshine (which inspired the card below) has been replaced by showers! 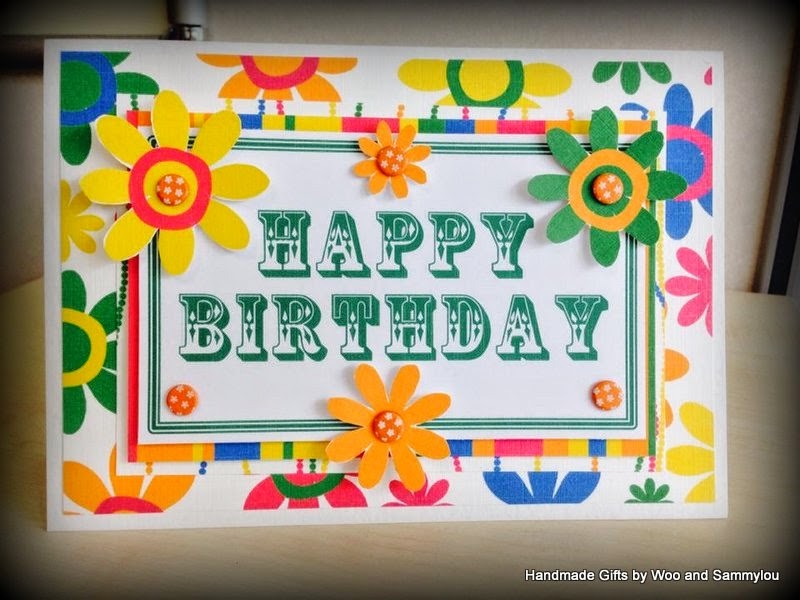 But with the sunshine in mind came this card, made using the Papercraft Factory Colour Me Happy CD rom by Funky Hand. Each month we like to share with you some of the wonderful papers available in the archives as it were at Funky Hand HQ and, I have to admit, I was more than a little excited when this was chosen. It is one of my favourite CD roms, mainly because it is so diverse. (And, if you don't believe me, check out the Get Funky and Craft blog to see what the rest of the Funkettes have made! I made this card for a lady at work and she is such a vibrant person, i knew that I would have to choose the Barbadian Ecstasy variation for her. As so often happens with me, I focused on the papers and the only embellishments added were the card candi and the sentiment which I printed out on Word.. Please pop on over and have a look at what we created and hopefully you will see that £6.99 is a tiny amount of money to spend considering the variety available on this CD.